Alvin Expedition Leader Bruce Strickrott has performed hundreds of these training briefings. “I think about it every time I dive: ‘Is this the day I’ll have to wear one of these?’ ” he said. Over two decades, Strickrott has never had to use EBAs and could recall only one time when they have been needed before Sunday, when Alvin made its 4,685th dive. But on Sunday, they were needed again, when a machine that scrubs excess carbon dioxide out of the sub’s sealed personnel sphere stopped working. There was no immediate danger of carbon dioxide poisoning. A backup scrubber onboard could have been set up if recovery of the sub was delayed for any reason. But safety protocols demand that in such a situation, EBAs go on right away and the dive be immediately aborted. Strickrott dropped all of Alvin’s weights on the seafloor 2,212 meters (7,257 feet) below the surface. The sub rose about 40 meters (130 feet) per minute and was back on the surface within an hour. 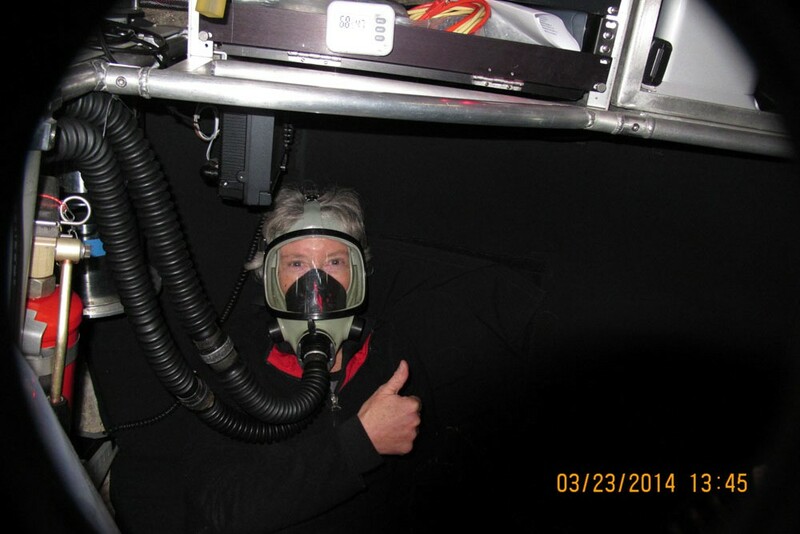 Cindy van Dover, a scientist at Duke University, was in the sphere on Sunday. She has dived in Alvin many times, not only as a scientist, but also when she herself was an Alvin pilot from 1989 to 1991. During Sunday’s dive, Strickrott was getting ready to core a sample of seafloor sediment, “when we heard the scrubber motor wind down,” she said. Van Dover had just traveled by a small catamaran to transfer to the research vessel Atlantis on Saturday, and she received her safety briefing Sunday morning before her dive. Alvin has to bring its own atmosphere with it to the bottom of the ocean in its sealed, 6.5-foot-diameter sphere. It packs 12 bottles of oxygen, each holding 22 cubic feet of pure O2. When Alvin is on Atlantis‘s fantail, but before the observers board, the pilot will open one of the valves to start the flow of oxygen. It slowly bleeds oxygen into the sphere to keep the O2 content of the air inside about same as you normally breathe. A typical dive uses two bottles. But Navy regulations require a 50-percent safety margin, adding a third bottle, and an additional 72-hour supply, or nine more bottles, in case the sub cannot be recovered on schedule due to high waves at the surface or other conditions. Passengers inhale oxygen in the air inside the sphere and exhale carbon dioxide. That gas would build up in the sealed sphere, and eventually cause carbon dioxide poisoning, if not for the CO2 scrubber. It draws in air from the sphere, passes it over CO2-absorbing material, then returns the scrubbed air to the sphere. Alvin carries three sets of absorbent material. Most dives require one, but pilots can switch to a second if necessary. The third is a spare. Alvin also carries four EBAs (one for each passenger, plus a spare). These are essentially the same rebreathing devices used by divers or miners in emergencies. They have built-in CO2 scrubbers and must be tightly sealed to prevent any leaks. They would also be used in case of fire or smoke in the sphere, or if fire extinguishers had to be used. 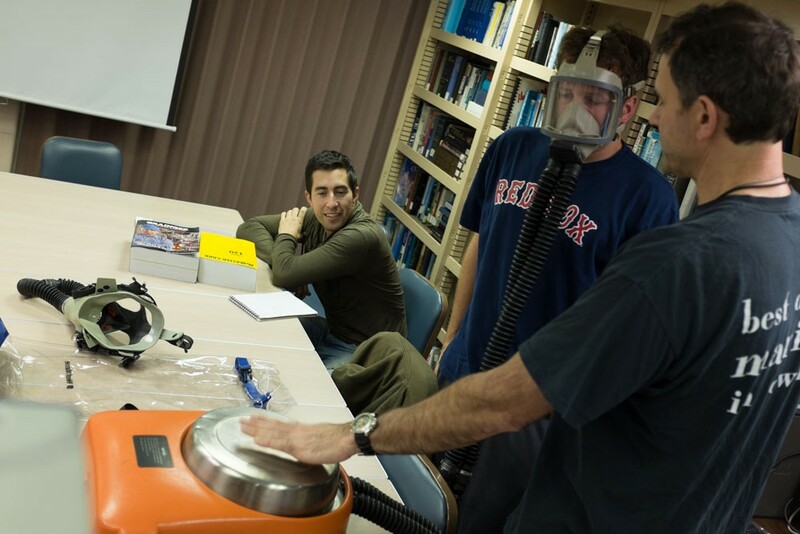 All potential Alvin divers are fitted with masks that are tested to be sure they seal tightly around their wearers’ faces as part of pre-dive safety training. Men with beards must shave them before diving to ensure the EBA will fit properly if needed. Duplicate sensors inside the sphere monitor oxygen and carbon dioxide levels, and alarms sound when levels start to move into unwanted territory. Pilots continually monitor the sphere’s atmosphere. “The whole sub is a life support system,” Strickrott noted. Atlantis’s crew expertly executed the expedited and unanticipated recovery. And it was also an unexpected test for the third person in the sphere, Jefferson Grau, a pilot-in-training, who experienced something that most other Alvin pilots have only trained for. He emerged from the sphere and went about his business. Van Dover also was unfazed as she exited Alvin and rejoined her fellow scientists on the back deck of Atlantis. “Do I have mask-face?” she asked with a laugh. After recovery, the Alvin group repaired the malfunctioning carbon dioxide scrubber. But to dive, the sub requires a working scrubber AND an onboard spare. Without available spare components, Alvin does not meet minimum requirements for resuming dive operations. Glad everyone is OK! Was the malfunctioning carbon dioxide scrubber part of the upgrade? Or was it part of the “old” sub? Thankful Bruce and Cindy were so professional, and knew exactly what to do. The scrubber was the same one that had been used for more than a decade in the old Alvin. Mechanical devices have lifetimes, and they conk out, much like a fan in your hairblower might. You never can predict when they’ll conk out.